IF YOU are in Martinborough and find yourself a little bored with nice wines and good eateries, then why not treat yourself to a road trip that will not only have you smiling, but will get your heart racing. All you need to do is pack a little picnic, some drinks – non-alcoholic preferably – and then set your car in a south-easterly direction through some really pretty landscapes of farms and hills. Your destination is only an hour away and is the lighthouse at Cape Palliser that sits on a rock ledge towering over the sea and countryside around. But the journey is more than that stunning view, for along the way you can stop at the unique crayfishing village of Ngawi – complete with a tractor called Tinky Winky – and then find yourself up close and personal with seals in a large colony just before the lighthouse. In winter weather the drive along the road between major hills and cliffs is impressive; in summer it is breathtaking as brown rock and grass meet blue sky over deep green and dark blue waters of Palliser Bay. The colours are rich and silently demand that the car be stopped and the cameras brought out. Oh to spend a week here. Ngawi is a delight. On the hills side of the road are pretty houses while on the large pebbled beach is the working area. Large and little fishing vessels sit waiting on their trailers and small and sizeable tractors sit ready to push them to or pull them from the water. It is an amazing array of equipment and, if you are fortunate, a boat will arrive ready to be hauled on to its trailer and towed up the beach. Take my word it is well worth enjoying the spectacle and the ease with which such big bits of machinery are brought safely up the pebbles and put to bed. 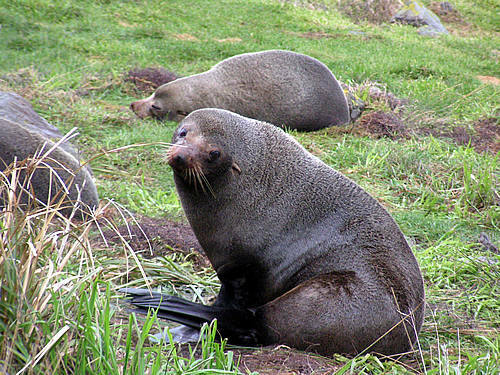 About five kilometres on from Ngawi, and not far from the now spectacular red-and-white lighthouse, is the North Island’s largest NZ fur seal colony. While their odour is not the most pleasant these creatures are fantastic to watch as they swim, gaze around or just loll about on their rocks. You can get reasonably close for photos – telephoto lens close that is - but never get between a seal and the ocean and be mindful not to scare them. When the waves crashing on to the colony’s rocks are large you can watch as seals duck under the swells, much as humans do in breakers at the beach. If you have the time I’d recommend sitting down on a rock overlooking the beach and just observing these wonderful creatures as they go about life. They are the most common seals in New Zealand waters with an estimated population of 100,000. While fur seals are extremely good swimmers, they are not so hot on land – for while they can move quickly, they can get disoriented and can wander away from the water into people’s backyards and houses. 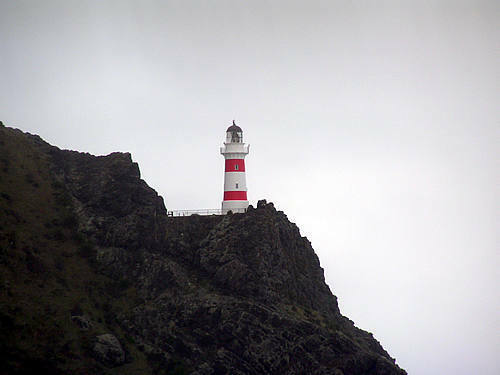 While we could have sat all day with the seals our target was the Cape Palliser lighthouse and so it was onwards and upwards. Parking the car below the lighthouse we watched as other visitors made their way up the single flight of steps to the warning station that flashes its brilliant message about every 20 seconds. It was a long way and can be daunting for some, but having trudged my way up the 253 stairs before I knew what was in store – and the rewards for doing so. I’ll not lie, the leg burn started at about step 181 and the breath ran out 19 steps later. Fortunately having cameras means you can cover stopping to catch a breath by framing up a shot or two. Step 215, not far to go, steps 230 and 231 uh oh there goes the breath again, powering home now I’ll wait until I get to the top before collapsing. And what a sight awaits. There you are looking over a beautiful bay and landscape from a platform where, on a clear day, you can see the South Island. After you have taken in as much beauty as you can manage its time to head down to the car park and return to Martinborough where it’s probably about time for a local vino and a much-anticipated meal.